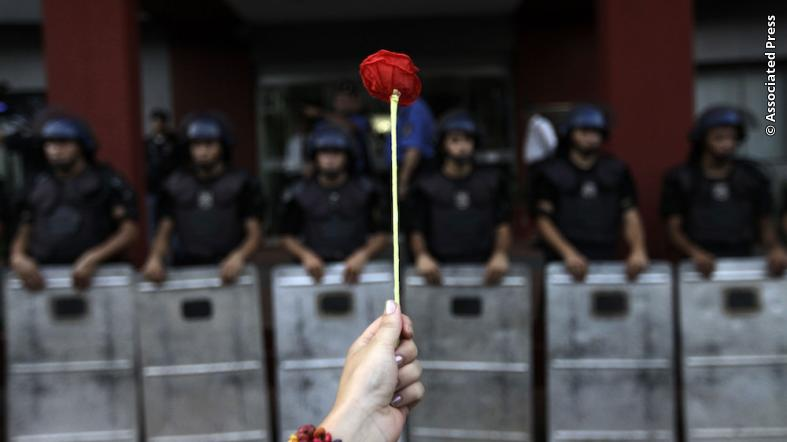 An activists holds up a flower in front of police officers during a demonstration marking the International Human Rights Day in Asuncion, Paraguay. Protecting human rights for all is essential to maintaining international peace and is a core element of U.S. foreign policy. Throughout the year, the Bureau of Democracy, Human Rights, and Labor supports the vital work of human rights defenders who tirelessly document abuses and hold governments accountable. On this Human Rights Day, we highlight some of the heroes we’ve met over the past year who are advancing human rights around the world. During the 16 Days of Activism Against Gender-Based Violence, we chatted with Salman Sufi, Director General of the Chief Minister’s Strategic Reforms Unit -SRU in Punjab Province, Pakistan. We discussed community organizing, overcoming barriers to inclusion, and Salman’s approach to advocating for women’s rights. During this year’s Community of Democracies Ministerial, we heard from four distinguished youth participants from Sri Lanka, Hong Kong, Afghanistan, and Belarus. They discussed the challenges and opportunities they face in making change in their communities. In honor of Transgender Day of Remembrance, we chatted with Harper Jean Tobin from the National Center for Transgender Equality about her experience as a transgender advocate and how we, as individuals, allies, and advocates, can support tolerance, diversity, and LGBTI equality. We remember those who are suffering around the world and those who strive to make it a better place. The United States will continue to support human rights defenders and urge all nations to observe the principles of liberty, democracy, free expression, and equal protection under the law. Editors Note: This entry originally appeared in DipNote, the U.S. Department of State’s official blog.